The ultimate guide to Champoluc ski holidays in 2019 & 2020. Champ is the main resort in Ayas Valley, which is one of the three lift-linked valleys (Ayas, Gressoney and Sesia) that make up the Monterosa ski region. Sharing 180km of piste between them, Monterosa has been dubbed Italy’s very own Les Trois Vallees and won the ‘Best Upcoming Resort’ at the 2012 World Snow Awards. Sat in the shadow of Monte Rosa massif, the area is famous for its mind boggling views of the 4000m+ peaks including alpine legends Monte Blanc and the Matterhorn. As the largest of the Monterosa resorts, it has more of a ski town vibe than the nearby villages and hamlets. Surrounded by snow-topped pines, it’s an authentic mountain town through and through, complete with an old church, village square and chalet-style buildings that stretch down a long mountain road. While less sleepy than other villages in the area, the town retains a low key atmosphere with a handful of family run restaurants and good quality bars. Accessible within a couple of hours drive, the nearest airports are Turin (1hr 30min drive) and Milan (just over 2h), with a number of taxi services providing first class transfers all across the Aosta Valley region. Also in the Ayas valley, 3km to the north, cute hamlets include Saint Jacques and Frachey, which besides Champoluc itself, is the other place with gondola access to the ski area. Antagnod to the south has fascinating historic architecture and its own small ski area. Buses also run from Periasc and Brusson back up to the main village, giving you great choice on how close to the action you stay. The Monterosa Ski pass covers around 180km of piste across the lift-linked towns of Champoluc, Gressoney Stafal, La Trinite & St Jean and Alagna and individual resort passes are also available if you don’t intend on leaving one particular valley. View our detailed Champoluc snow forecast or snow report and see all live webcams, piste maps, road and travel maps and lift pass prices. For a picture of historic snow conditions see the snow depths month by month with our Champoluc snow history. Dubbed Les Trois Vallees of Italy, the Monterosa region has some fantastic piste and with the Monterosa Ski Pass as well, you’ll have free reign to ride any slope you desire. For beginners, Antagnod is a great starting point. A short bus journey outside the main town, it has a magic carpet and two chair lifts serving three blue slopes, one red and a short black. From the Frachey gondola, you can take the Alpe Mandria and enjoy the Del Lago blue back to the Frachey side, or cut off early and trying your hand at the Contenery and Ciosal red, to then work down the lengthy Belvedere blue on the Champoluc section. If you’re an intermediate, the Monterosa is your oyster. From the Champoluc lifts, take the Ostafa Galle Sarezza chairlift to Mt Sarezza at 2702m, and ski the challenging Sarezza before linking up to Ostafa back to the top of the Crest gondola. Alternatively, work your way to the Frachey lifts; taking the sharp descent down the Sarezza Contenery. For the most challenging runs, you may need to head further afield. Our favourite is the Olen black run, which is the only piste run down to Alagna, from the 2971m peak of Passo Salati. Experts will also enjoy the freedom to make long descends from high peaks on some good red runs as well. Book a guide who can show you some of the best off-piste runs in the Aosta Valley. After a fresh powder dump, the descent from Punta Indren 3260m down to Gressoney is one of the best places to make fresh tracks. Heli-skiing is also available across the region. Gressoney’s snow park on the Gabiet Lago blue is the hub of freestyle action, with a mix of small and large rails and kickers. Watch the sun go down over the shoulders of Monte Blanc and the Matterhorn from 2400m at Refugio Belvedere’s sun terrace- also a perfect place for a spot lunch while descending the blue Belvedere. Rifugio Vieux Crest’s bar is also a very chilled out place for a beer. There’s a nice mix of independent as well as hotel based restaurants open to the public including Hotel Castor just across the road from the Champ’s church square. For great pizza cooked in a traditional wood burning oven, check out Kremer Thal in Antagnod. Champoluc is a patchwork of local shops with hand crafted goods perfect to take home as souvenirs. The Maison Fouriner and San Martino parish church in Antagnod are also great historical sites just a short bus ride away if you fancy taking some time off the slopes. For activities which don’t involve tackling the piste, there’s an ice rink in Brusson, a short bus ride down the valley. The eco-adventure park is also good fun for people of all ages and just by the Crest gondola, with Bruno’s bar being a usual stop off point after this high wire park. Similarly, guide operators offer ice climbing and snow shoeing activities. When is the best time to ski Champoluc? Snowfall in the resort is quite consistent from the start of December until around mid-March; so regardless of your commitments to peak times, the piste won’t be too busy much of the year. January and February snowfalls have been good in the past, and for those that have the flexibility, it would be rude not to take advantage of the great powder and the empty piste in off-peak weeks. With lifts providing access across the entire region, you should be able to find good powder throughout the season. Champoluc itself is based at 1570m, and with much of the piste above 2000m, reaching a top altitude of 2971m, this is always a good place to take in some of the great white stuff. Off-piste and heli-skiing on the northern massifs such as the Matterhorn, Monte Rosa and their sisters are also snow-sure enough for some great skiing throughout the season. Champoluc is a super place for families in the Monterosa region, if you’ve all skied before as the intermediate terrain is awesome. If you are new to skiing, the ski school here has a great reputation and there are some very kind and easily accessible blue and red runs on the main piste as well as in nearby Antagnod. For experienced families, the intermediate runs have a wide mix of wide cruisers, tree lined trails andsteep descents. The snow park in Gressoney is great for all levels of expertise. For younger children not yet ready to take to the slopes, Ski2 Mini Club for kids up to 12 is also an option for families with youngsters. A traditional alpine town with a modern feel, the local restaurants are welcoming and have some great food choices. You won’t be short of finding good pizza here, and Lo Bistrot has some of the best. 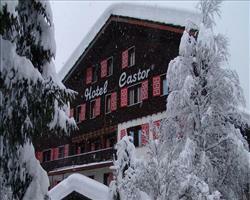 Many of the hotel restaurants such as Hotel Castor, Petit Tournalin and Hoel Le Sapin are also open to the public. The extensive piste means that the clan should be well worn out by the end of a day hard skiing, meaning cosy evenings snuggled up in your hotel or apartment. If you all have a good energy reserve, a number of hotels have swimming pools. A particular favourite for kids not on the piste is the eco-adventure park. Located by the main town gondola, this it is perfect for children of all ages as well as parents. 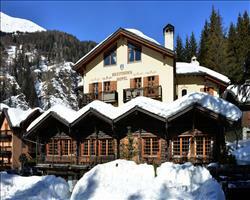 Groups looking for adventure will have a blast in Champoluc. With 180km of piste across the entire Monterosa area, there’s a lot of piste on offer and much of it rarely used. The Monterosa ski pass will enable you to take advantage of the wide variety of slopes across the valleys, perfect for groups of mixed abilities. A snow park in the Gabiet Lago blue run on the Gressoney side of the piste also allows you to enjoy kickers and rails of varying size, perfect for a group of mixed abilities. If you’ve all been skiing or snowboarding for donkey’s years, the off-piste skiing and heli-skiing in this region is some of the best you’ll find in Italy. 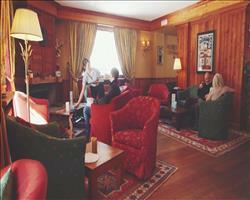 The après ski is friendly and relaxed - great for those looking to relax while not on the piste. If you’re craving some cheesy bar action, the West Road Bar has karaoke, and Café Rimaud does a great selection of cocktails and tequila. For the non-skiers, this region has some great history. Maison Fournier, the former strong hold of the Counts of Challant is now a host to the permanent exhibit of Valdostane crafts set in the idyllic town of Antagnod. You may even be lucky enough to catch the town during one of its crafts fairs, with handmade objects from the local Walser community. As a non-ski activity, try out the eco adventure park by the Crest gondola. Suitable for all ages, it involves a mixture of high-wire and ladder climbing; great for taking a unique angle on the stunning views of Monte Rosa massif. We were very fortunate to have perfect weather – there had been an enormous dump of snow the week before, leaving fresh snow at the beginning of the holiday. Then we had blue skies and sunshine every day. There is lots of skiing but the only downside is that Champoluc itself isn’t particularly exciting and could have done with some more apres ski. We had a good holiday; Champoluc is a fairly quiet place but it’s a nice place to be and the whole thing suited us fine. The hotel is right next to the ski lift so you can basically hop over the fence and get into the lift. We had half board and the food was very nice, we got a free bottle of wine every night and the cheese board was very good too. The backdrop of the Monterosa Massif alone’s enough to make the pulse quicken, and with more than 10 peaks breaking the 4000m boundary, this area’s one of the world’s best for heli-boarding. There’s plenty of powder to ride if you don’t have a chopper, too: the ski area alone covers 3 valleys, and I can’t get enough of the middle one at Indren. Served by the Passo dei Salati-Indren gondola, there’s one marked route, and you can carve your own way down on the rest. Moving onto 180km of inter-connected pistes, the area is mostly red with some cracking runs from Gabiet-Passo Dei Salati, like Salati, a steep, testing red and Olen, a groomed black. Of the red runs closer to home, testing Sarezza-Contenery is not to be missed, and the Del Bosco is a thrilling descent into town. If the snow is good, I would say that it’s a good resort for intermediate and advanced skiers. "Off piste paradise with snow, a quarry without"
Champoluc is somewhere you go for the off piste skiing, not for the scenery – it’s not like the Dolomites which are very pretty. We are experienced skiers and the off piste was the reason we came here. Usually Champoluc is Off Piste Paradise but when we stayed there was very little snow and conditions were a bit scratchy. While we’d booked two weeks we ended up coming back after a week. We’ve skied all over the world and it’s always pot luck with snow conditions! We skied the pistes for 4-5 days and they did a good job with snow cannons. For a lot of people it would have been absolutely fine but the off piste was like skiing in a quarry. The village itself is very, very quiet. We found it a bit weird, not unfriendly but not like other places we’ve skied. I definitely wouldn’t recommend it to non-skiers as other than a few shops there isn’t much to do. A fantastic small resort in Italy, we turned up being relatively experienced skiers and expecting to get bored towards the end of the week. We were pleasantly surprised however, and managed to be kept busy exploring for all 6 days of skiing. You can ski the whole way from top to bottom of the mountain, a run for any budding speedster. As for après, we were very happy in the bar Pachamama for 3 crazy nights of the week, taking the interceding nights gently for recovery. However, there’s not a whole lot of après aside from this, so if you’re looking for a quieter holiday, Champoluc is definitely the way to go.